Palmilla Golf Club was Jack Nicklaus first Latin America design and is recognized as the Grand Dame of golf in Los Cabos. Challenging, masterfully-conceived and stunningly beautiful, Palmilla has ocean views from every hole. 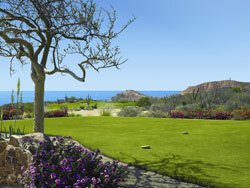 The Ocean Course actually flows to the ocean as you play along the beaches of the Sea of Cortez. This 27-hole course is perched on deep canyon arroyos and sits among century old cardon cacti. Palmilla is a great resort course with daily trade winds that enhance pinpoint accuracy and challenges even the most experienced of players. A Mexican-decor clubhouse, on-site pro-shop and expert staff help provide for your every need. With its skillful design, expert management and idyllic locale, Palmilla Golf Club is recognized as one of top four courses in Mexico, and one of the finest in the world. The course is divided into the 3,337-yard Arroyo Nine, the 3,602-yard Mountain Nine, and the 3,548-yard Ocean Nine. The five sets of staggered tee boxes ensure an exciting game for golfers of every level. The Ocean Nine layout, featuring a 600 elevation change from hole 1 to hole 6, takes advantage of the natural desert and mountain terrain, and features challenging directional changes. All rates are per person and include green fees, shared golf cart, bag tag, yardage book, practice facilities and bottled water. A maximum of 4 players per starting time (groups may be paired up). Rates are subject to 16% tax. All rates and times are subject to change without notice. Non-Golfers will be subject to a fee paid upon check-in. For groups of 16 or more please contact us for rates and terms. Use our map below to explore Cabo San Lucas, San Jose del Cabo, Pedregal, the Tourist Corridor, East Cape, La Paz and Loreto. Each map indicates local streets, highways and beaches, and has links to individual villa and resort listings.